Before there was Maureen Dowd or Gail Collins or Molly Ivins, there was Mary McGrory. She was a trailblazing columnist who achieved national syndication and reported from the front lines of American politics for five decades. 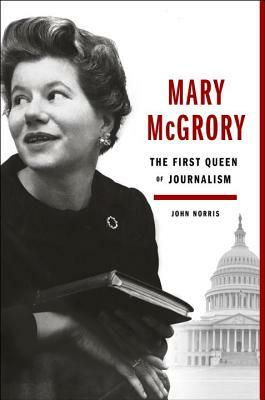 From her first assignment reporting on the Army-McCarthy hearings to her Pulitzer-winning coverage of Watergate and controversial observations of President Bush after September 11, McGrory humanized the players on the great national stage while establishing herself as a uniquely influential voice. Behind the scenes she flirted, drank, cajoled, and jousted with the most important figures in American life, breaking all the rules in the journalism textbook. Her writing was admired and feared by such notables as Lyndon Johnson (who also tried to seduce her) and her friend Bobby Kennedy who observed, "Mary is so gentle--until she gets behind a typewriter." Her soirees, filled with Supreme Court justices, senators, interns, and copy boys alike, were legendary. Writing about Donald Trump's first divorce in 19990, she said, "Watching the Trumps, Washington thinks of itself as wholesome.'" As the red-hot center of the Beltway in a time when the newsrooms were dominated by men, McGrory makes for a powerfully engrossing subject. Laced with juicy gossip and McGrory's own acerbic wit, John Norris's colorful biography reads like an insider's view of latter-day American history--and one of its most enduring characters. John Norris is the executive director of the Sustainable Security and Peacebuilding Initiative at American Progress. Previously, he served as the Washington chief of staff for the International Crisis Group and the director of communications for U.S. Deputy Secretary of State Strobe Talbott. He has written for Politico, The Washington Post, the Los Angeles Times, and The Wall Street Journal.